We stayed, as usual, at the Hotel Canada in the historic center. Although this hotel is pretty basic (with s-l-o-w wifi), the location is perfect. At US$35 per night, it’s also among the least expensive hotels we’ve stayed in. We’re not sure why Americans like staying in Polanco; the Centro Historico is not only safe, it’s in the middle of all the sights that one would want to see. And it is across the street from Café Popular, which has the world’s best coffee, poured from a pitcher into a glass which is then filled with steamed milk. Hotel Canada is also next door to Jugos Canada, which has fantastic licuados (fruit shakes). Museo Soumaya – There are three museums clustered in Polanco: The Soumaya, with Mexican and international paintings and sculpture; the Jumex, featuring modern art, and the new Acuario Inbursa (Aquarium). We decided to visit just the Soumaya. Unfortunately, the special Rodin exhibit was inexplicably closed. In any case, their collection was worth the trip. Palacio Nacional Murals – we’ve seen Diego Rivera’s murals at the Palacio Nacional a number of times, but decided to see them again. These are possibly Rivera’s most famous murals – and should not be missed. Ballet Folklorico at the Palacio Bellas Artes – We’ve seen the Ballet Folkorico when they were performing at a university in DF. But seeing it in this amazing palacio is worth the admission. The lavishly decorated interior adds to the entertainment. The view from the balcony allows you to fully appreciate the choreography and to get a full view of the amazing stained glass curtain while waiting for the performance to begin. The halls of the theater have murals from many of Mexico’s masters, including Diego Rivera and David Orozco. We spent one night in Queretaro, about 3 hours from DF, to visit Phil’s Spanish teacher, Laura Olachea http://spanishwithlaura.com, taking weekly lessons via Skype. 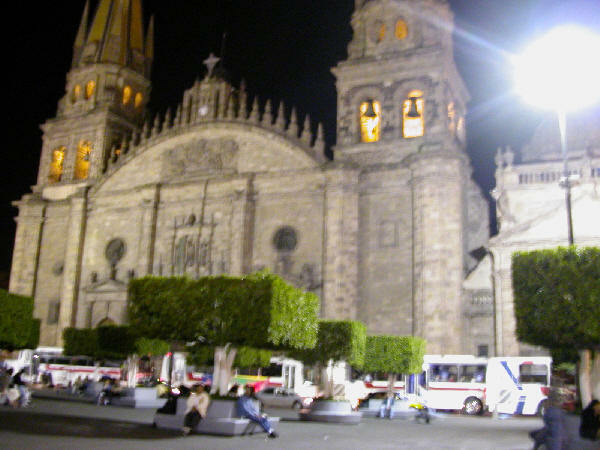 Queretaro is filled with beautiful architecture, many plazas and lovely quiet streets that don’t allow cars. We hadn’t been there for years and really enjoyed it. There are regular very comfortable buses from the Norte station. Azul Historico – Located in a converted palacio, across from the Casino Español De México, we’ve walked by this restaurant dozens of times, but this is the first time we ate there. The setting is very romantic, the food excellent, and the prices are very reasonable. Delicious mole! El Cardenal – This was another restaurant that we walked by dozens of times during previous trips. El Cardenal is primarily a lunch spot, but is open until 7pm. We had two different moles, both were among the best we’ve ever had. The service was impeccable, and the ranchera-style musicians were great. The wifi was blazingly fast – just ask for the “contraseña”. El Rincon Tapatio – Just a few yards from the Museo de Arte Popular, on Av Independencia 68. There are tons of great taquerias in DF – and this is among them. Whenever I’m in DF, we make a point of having lunch here. Try the alambre large, al pastor or arrachera. for two people. Too good! Hotel Canada – Hotel Canada isn’t a fancy upscale hotel, it’s basic, good quality, and low cost. But what’s most important is its location. Being just over 1 block from the zócalo, the metro, the Catedral Metropolitana, and just about everything that brings people to D.F. The wifi is terribly s-l-o-w, but I don’t go to Mexico to surf the web. The breakfast is included in the room rate. We brought our own granola; eating enchiladas for breakfast just isn’t very appealing. Tips: rooms over the alley (callejon) have windows that open, and being off the main street is quieter. Some rooms only have windows that open to an air shaft (ugh!). Pay cash and you’ll get a discount (but ask for it! ), and try booking.com and hotels.com for the best rate. Note that they speak almost no English. Hotel Serafin, Queretaro – This hotel looked nice, but they cancelled our reservation with just a few days warning, despite having made it 3 months earlier! No apology, no explanation. They probably had a guest who was willing to pay more. Grumble. We scrambled and found another hotel nearby. Hotel Damiana Boutique – We chose the Hotel Damiana after our original choice cancelled a few days before our arrival, and we were so lucky that they did! The Damiana Boutique is a gem – it’s one of those rare hotels that does everything 100% perfectly — from the friendly greeting, the comfort and size of the room, the quietness of the hotel, and all the hotel amenities. The location of Hotel Damiana Boutique is also ideal – right in the middle of the city center, on a quiet pedestrian-only street, but only a half block from taxi access. What really stood out was the breakfast. The hotel gives you three choices: breakfast in your room, on a patio, or in a restaurant (around the corner). We opted for the restaurant, as we were a bit pressed for time. The breakfast was amazing – we had Huevos al la Mexicana (scrambled eggs with chilies, peppers, onions, and tomatoes) fresh handmade tortillas, fresh orange juice, café de olla (coffee spiced with cinnamon and orange peel). We chatted with the friendly staff as we watched them prepare the midday meal.